Country’s best broadband provider expands gadget portfolio with two new affordable Android tablets Skyworth S7 and Skyworth S8. Both gadgets are available on prepaid and postpaid plan with free Globe Tattoo Wi-Fi stick that you can use as portable hotspot. The two tablets offer decent specs at entry level price, with Tattoo you can avail S7 and S8 at starting consumable postpaid Plan 299. Also available at Plan 499 with lower cash-out on a two-year lock-in period. To those who love to stay connected 24/7, you can avail both gadgets at Plan 999 with unlimited browsing experience. You can also consider getting these two tablets under Globe prepaid pricing, get S7 for the price of P5399 and S8 at P7499 both with free Tattoo stick through cash payment or via credit card. These two tablets will surely fit to students and young professionals who consider gadgets as their partner to maintain productivity while on the go. Nowadays most people consider using tablets in doing research and accessing internet compared to laptops. Aside from the price value, tablet also provides convenient in terms of size, weight and of course tablet is very portable and can handle laptops basic task. Globe offers these two tablets with Jellybean OS out of the box, 1GB RAM, Wi-Fi capable, dual camera and Cortex processors. 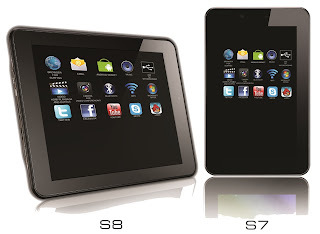 S7 owns a 7 inch capacitive multi touch screen, Bluetooth and Wi-Fi connectivity that you can use along with your Tattoo Wi-Fi stick. Skyworth S8 also has an 8 inch screen size that runs on 1.6 GHz dual core processor, Wi-Fi capable and a powered up battery life. sana maganda ang unit na ibigay ng Globe, sana kung ano ang nasa specification yun talaga.